Gliclazide is an oral antihyperglycemic agent used for the treatment of diabetes mellitus type II. It belongs to the sulfonylurea class of insulin secretagogues, which stimulates β cells of the pancreas to release insulin. Gliclazide binds to the β cell sulfonyl urea receptor (SUR1), further blocking the ATP sensitive potassium channels. Therefore, the potassium efflux substantially decreases, causing depolarization of the β cells. Then the voltage-dependent calcium channels in the β cell are open, resulting in calmodulin activation, which in turn leads to exocytosis of insulin containing secretorty granules. Recent studies have also shown that gliclazide can effectiveimprove anti-oxidant status and nitric oxide-mediated vasodilation in Type 2 diabetes and protect pancreatic beta-cells from damage by hydrogen peroxide. Gliclazide, chemical name is 1-(hexahydrocyclopenta [c] pyrrole-2 (1H)-yl)-3-(4-methylphenyl) sulfonyl urea, is the second generation of sulfur ureide oral hypoglycemic agents, and it also has dual function of hypoglycemic and improving blood clotting. It not only can improve the metabolism of diabetic patients, but also can improve or delay the occurrence of diabetic vascular complications. Gliclazide was developed by the French SERVIER company, and listed in France as early as 1972. Its trade names are diamicron gliclazide, methanesulfonic bicyclic urea to g pancreas, methanesulfonic grid urea, glick that sa. It is mainly used for the treatment of the onset of diet and exercise alone control ineffective of adulthood, and no ketosis tendency of light, moderate the type II diabetes. It also can improve diabetic retinopathy and metabolic disorders, vascular function. It can be used with biguanide oral hypoglycemic drugs, and used with insulin to treat insulin-dependent diabetes mellitus, in which condition that insulin dosage can be reduced. 1980s, it began to be supplied into the Chinese market. Now there has been more than 130 countries worldwide that registered and sold. 1. Hypoglycemic effect: gliclazide is the second-generation oral sulfonylurea hypoglycemic agents. Its role is more than ten times stronger than tolbutamide. Mechanism of action is to stimulate pancreatic β cells to release insulin, and then the high blood sugar drops. This may be because that sulfonylurea combines with β cell surface receptor, and increases the activation and simultaneously improves the sensitivity of outer periphery of the target tissue to insulin. 2. It can reduce platelet aggregation and adhesion, and prevent fibrin depositing in the microvasculature. 3. It can lower cholesterol savings, and reduce plasma concentrations of arterial triphosphate glycerides and fatty acids. The role of the three not only can treat diabetes metabolic disorders, but also prevent and treat complications like the development and progression of diabetes-blood vessels, retinal, renal disease. The absorption of gliclazide is rapidly when it is taken orally. The plasma concentration peaks after two to six hours. Plasma protein binding rate is 94.2%. Τ1/2 is about 12 hours. Gliclazide is mainly used in the liver metabolism, and its metabolites has no hypoglycemic effect. 98% is excreted by kidney in less than 48 hours, and the content of unchanged drug in the urine is less than 5%. Cyclopentane ortho anhydride as raw materials, ammoniates to obtain cyclopentane phthalimide. It reacts to obtain azabicyclo through catalytic reduction by catalysts like LiAlH4, KBH4/ZnCl2 or black platinum. And then azabicyclo reacts to give N-3-azabicyclo [3, 3, O] octane hydrochloride by nitrosation, zinc reduction. Finally it reacts with toluene sulfonylurea to obtain gliclazide through condensation. 1. For adults with type 2 diabetes, diabetes associated with obesity or vascular lesions. 2. Hypoglycemic agents. It can be used for the treatment of non-insulin dependent diabetes mellitus. 3. Hypoglycemic agents, non-insulin dependent diabetes mellitus. The above information is edited by the Chemicalbook of Ge Qian. Occasional mild nausea, vomiting, abdominal pain, constipation, diarrhea, erythema, urticaria, thrombocytopenia, neutropenia, anemia. Most adverse reactions disappeared after withdrawal. 1. Forbidden for patients allergic to gliclazide or sulfonylureas, sulfa drugs. 2. Forbidden for patients with type 1 diabetes. 3. Forbidden for patients with diabetic pre-coma, diabetic ketoacidosis. 4. Forbidden for patients with severe liver and kidney dysfunction. 5. Forbidden for leukopenia patients. 6. Forbidden for patients with stress situations like coma, severe burns, infection, trauma and major surgery. 1. When patients with type 2 diabetes have infection, trauma, surgery, stress situations and ketoacidosis and hyperosmolar nonketotic diabetic coma, insulin therapy should be used instead. 2. When the overdose of gliclazide, eating too little or strenuous exercise, you should take attention to prevent hypoglycemia. 3. You must regularly check blood sugar, urine, and take eye examinations. 4. When gliclazide is combined with anticoagulants, you should have regular blood clotting check. When gliclazide is used with nonsteroidal anti-inflammatory drug (especially salicylates), sulfa antibiotic, double coumarin anticoagulants, monoamine oxidase inhibitors, β-blockers, tetracycline, chloramphenicol, dicyclohexyl B piperidine, clofibrate, ethanol and other drugs, its dosage should be reduced to avoid hypoglycemia reaction. Fava, D, et al. "Gliclazide improves anti-oxidant status and nitric oxide-mediated vasodilation in Type 2 diabetes." Diabetic Medicine A Journal of the British Diabetic Association 19.9(2002):752. Kimoto, K, et al. "Gliclazide protects pancreatic beta-cells from damage by hydrogen peroxide. " Biochemical & Biophysical Research Communications 303.1(2003):112-119. 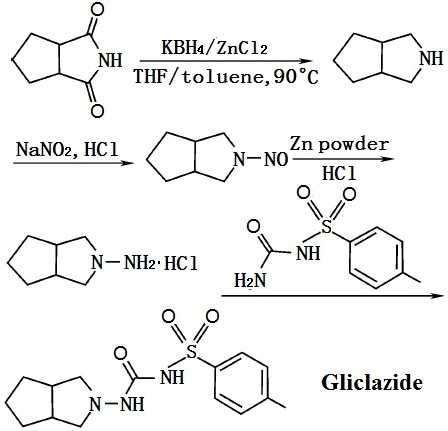 Chemically, gliclazide, 1-(3-azabicyclo[3.3.0]oct-3-yl)-3-p-tolylsulphonylurea (Diamicron), isvery similar to tolbutamide, with the exception of the bicyclicheterocyclic ring found in gliclazide. The pyrrolidineincreases its lipophilicity over that of tolbutamide,which increases its half-life. Even so, the p-methyl is susceptibleto the same oxidative metabolic fate as observedfor tolbutamide, namely, it will be metabolized to a carboxylicacid. 21187-98-4 US $100.00 / G 10G 99.8% 500kg/month Hebei Huanhao Biotechnology Co., Ltd.